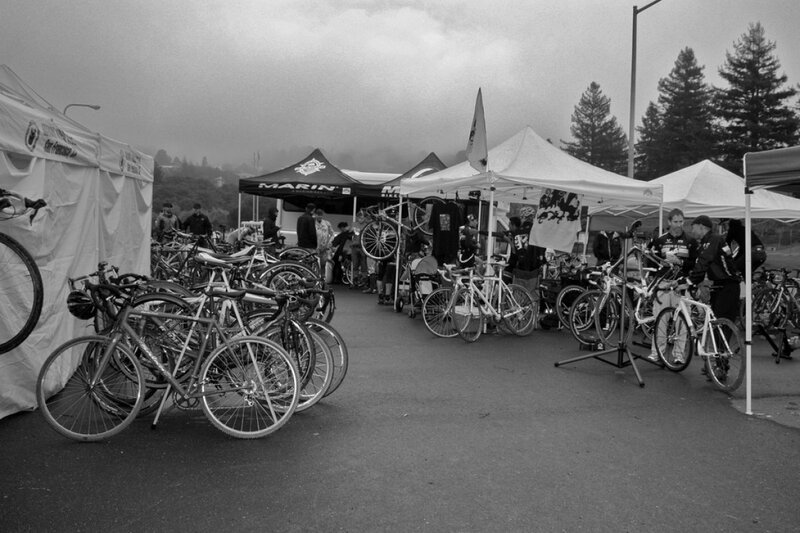 While there are several well-loved and well-attended race series in Northern California, nothing brings the Norcal cyclocross tribe together quite like the first Bay Area Super Prestige series. This year the series has made several significant changes, including adding a new venue, electronic timing, field limits, new categories and a soon-to-be-unveiled flyover. This year’s series got its start on October 17, and although the much anticipated flyover didn’t make an appearance, this first race race brought added excitement with the inclusion of Oakland’s Merritt College as a new venue, just a few miles from the site of the first USCF Cyclocross National Championships in Tilden Park in 1975 (see Cyclocross Magazine’s History of Cyclocross article and photos in Issue 6). The venue returned cyclocross to the East Bay hills, and Merritt College provided a particularly scenic venue, with the team tent area and much of the course overlooking a majestic mountaintop view of the port of Oakland, the Bay Bridge and, off in the distance, the skyline of San Francisco. 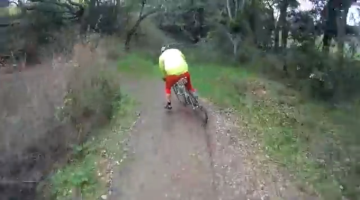 But clear views weren’t the story of the day, as Mother Nature also brought something special for Bay Area racers expecting dry, dusty conditions: the first serious rain of the season. 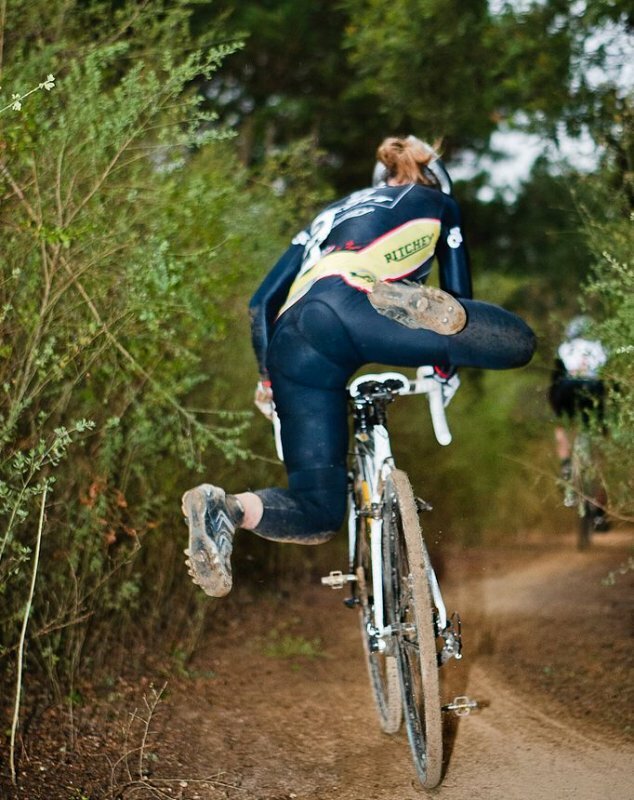 The later start times saw a loose and dusty course turn into an authentically sloppy race, a true treat for Norcal cyclocrossers longing for the more “traditional” conditions. 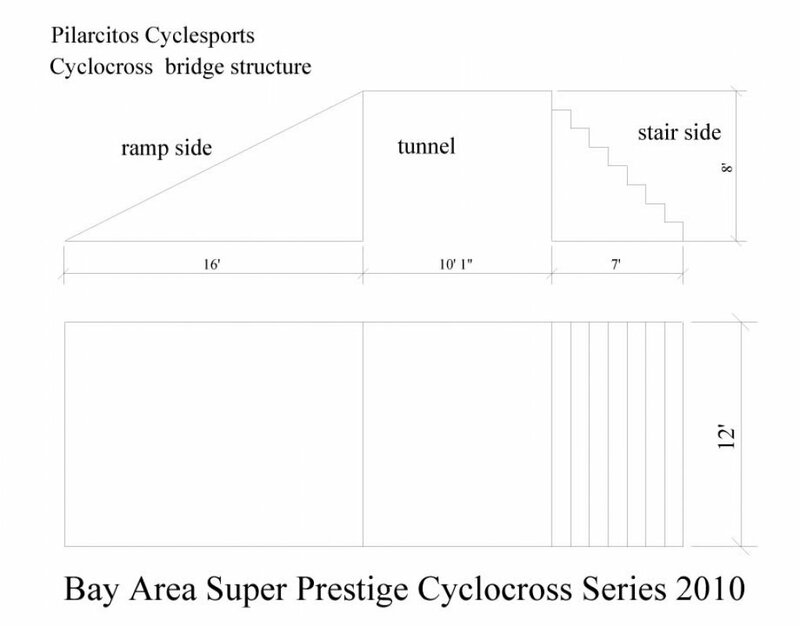 The blueprint for the Bay Area Super Prestige Flyover, coming soon. It will initially have ramps on both sides. 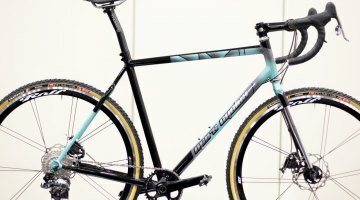 The Bay Area Super Prestige Oakland event lured 630 race entries, filling several fields to capacity, and offered racers several new changes: A new C 35+ category, field size limits, electronic transponder-based timing and concession stands. The new timing system promised fast, accurate results and lap times but had its costs, however, with entry fees rising by $5 to $35 to cover the technology and service fees. The new course was a short, serpentine, flowing, sandy route that wound its way between two parking lots and up and down a few short hills that were run-ups for all but the supremely skilled. One set of barriers greeted riders after the first pavement turn, on a slightly uphill grade. 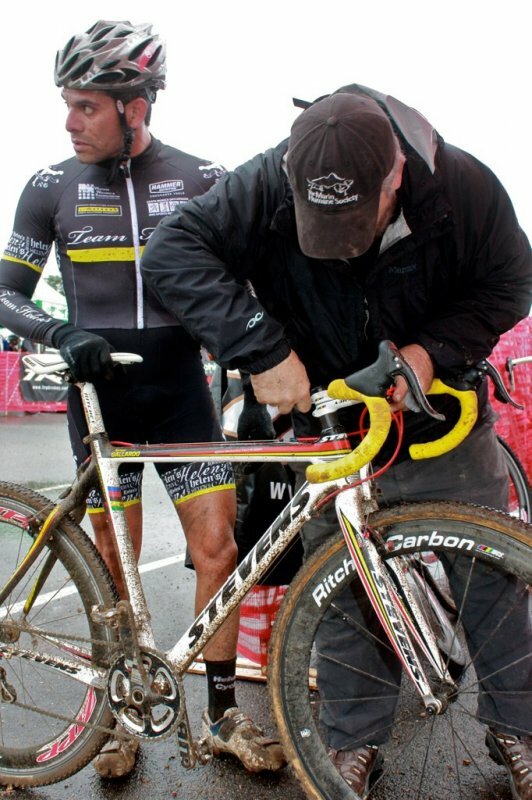 Two pits, supported by Zipp and Ritchey on opposite ends of the course, were primed to provide neutral support and spare wheels. 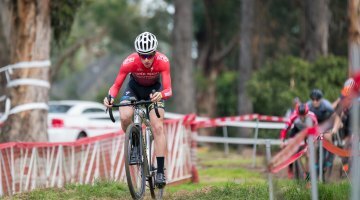 The opening race at the new venue had a bit of a rocky start (no pun intended) as the flint-filled course served up dozens of flat tires and quickly had racers running for spare bikes or the spare wheels. Promoter Tom Simpson proactively warned racers the day before about the flat tire potential, encouraging all to leave the expensive Dugasts at home, but flat tires still ruled the day. As predicted the day before by Simpson, the hidden rocks proved to be a factor, with flat tires affecting the outcome of each race. 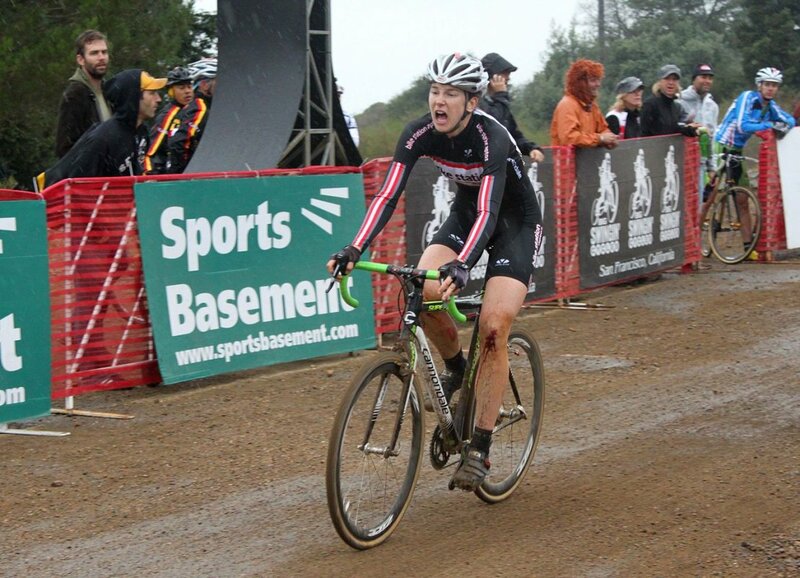 The Women’s A race, held in increasing showers, saw a sprint finish duel between former collegiate cyclocross national champion Devon Haskell (Bike Station Aptos) and current 35+ Masters cyclocross national champion Kerry Barnholt (Scott/Ritchey). Both Barnholt and Haskell suffered early flats, and while Barnholt led much of the race, a second flat gave Haskell the opportunity to rejoin Barnholt with one lap to go and fight for the win. The two entered the final straight together, with Haskell taking the final corner in the lead and sprinting to the win. Sara Maile (Ventana), Sarah Jordan (Bay 101/HRS/Rock Lobster) and former time trial world champion Karen Brems (Team Rambuski) rounded out the podium. 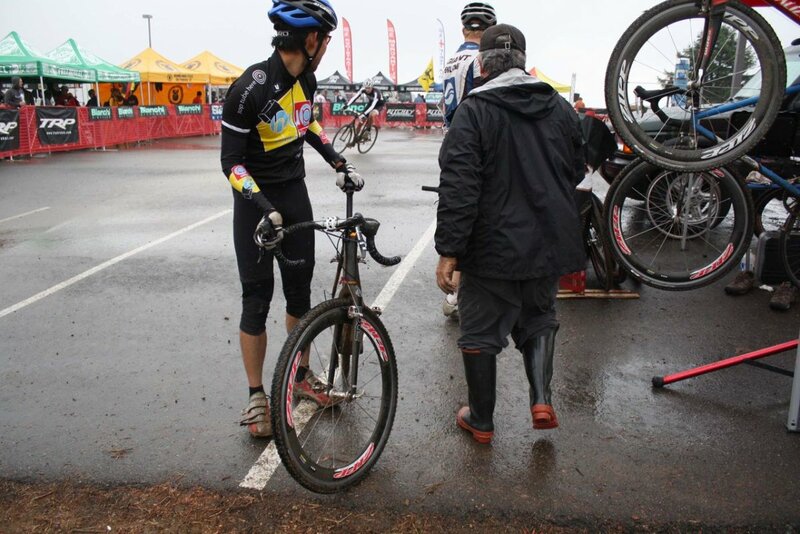 The Men’s A race saw periods of actual downpour, making the stone-strewn course all the more treacherous, leading to multiple wheel and bike changes and a well strung-out field. The winner of that race was Cal Giant Strawberry’s Steve Reaney (current Elite criterium champion). Reaney is a perpetual contender in the Masters A field, but suffered multiple flats in that event. Determined to end the day on a higher note, the Cal Giant rider grabbed his mountain bike for the main event, and used the fat tires and suspension to his advantage to stay flat-free and take the victory over Scott Chapin (Bay 101/HRS/Rock Lobster) and Brian Astell (Lost Coast Brewery). Krishna Dole (Sheila Moon) and Chris McGovern (Cycletron) completed the podium. Three of the top five racers finished on mountain bikes. Many podiums were missing the usual suspects, as flat tires hurt the chances of many of the favorites. 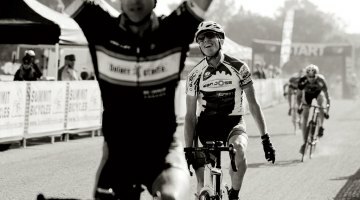 Perhaps suffering the worst luck was former national champion Don Myrah, who typically fights for victory in both the Elite and Masters A races. Myrah suffered multiple flats and broken wheels and did not finish either event. 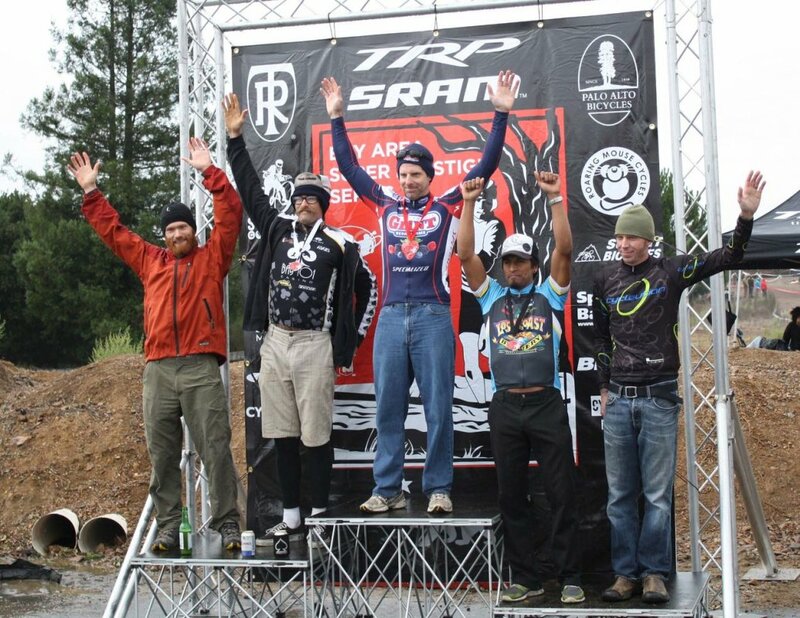 Alex Work of team Bay 101-HRS-Rock Lobster took the top step in the 35+ podium while Kevin Merrigan of Team Rambuski Law dominated the 45+ category. Complete results below (may not be final). Unfortunately, the first trial of electronic timing was not successful, as results were initially inaccurate and slow to post. 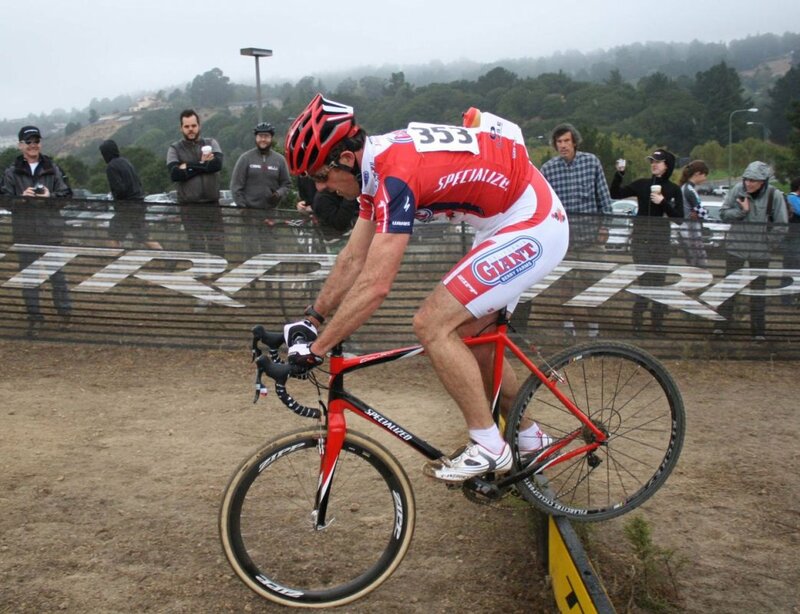 The Bay Area Super Prestige series continues next weekend with a return visit to San Mateo county’s Coyote Point Park, the site of one of California’s earliest UCI-sanctioned cyclocross race. 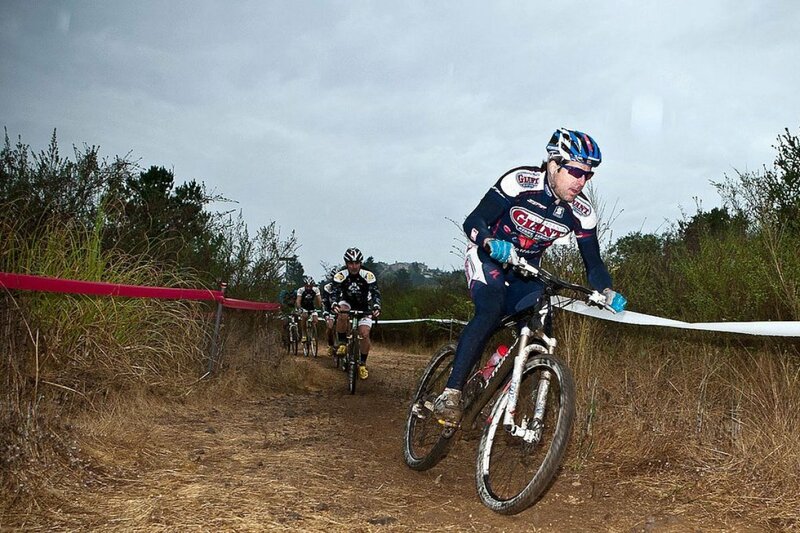 For more information on the series, visit the Bay Area Super Prestige website. 6 520 Gonzalo Guerrero ? 5 7 Chris McGovern Cycletron?